You can allow members of your church to see their groups within the Member Area. This can be enabled at a group category level. Simply edit the category and enable the setting and all groups within the category will be visible to members. By default group members are hidden from the Member Area to protect privacy. Members can decide if they would like to be visible to other members and also limit the visibility of their contact information. This can be done from Privacy settings page in My Profile. 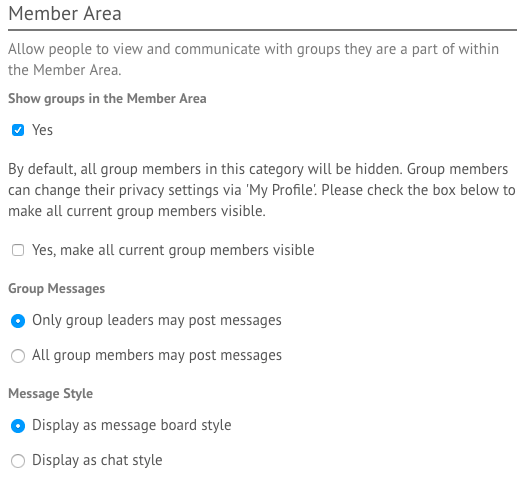 When enabling groups in the Member Area for the first time, you will be asked whether or not to make members visible. Choosing to do this will also ask what contact information to make visible. These options are helpful if you are enabling established groups in the Member Area.